Leading level crossing provider Polysafe have recently installed two level crossing systems for the Dean Forest Railway - a 4.25 mile long heritage railway that runs between Lydney and Parkend in the Forest of Dean, Gloucestershire. The systems were installed in two locations along the line; the first on the Lydney bypass, a busy A-road with a constant stream of town traffic; and the second was a road crossing three lines on a busy bend leading down to a railway station, recycling centre and harbour where the majority of traffic was made up of HGVs. The latter was to be installed on reclaimed land which is often prone to movement which in turn created a frequently high water table. 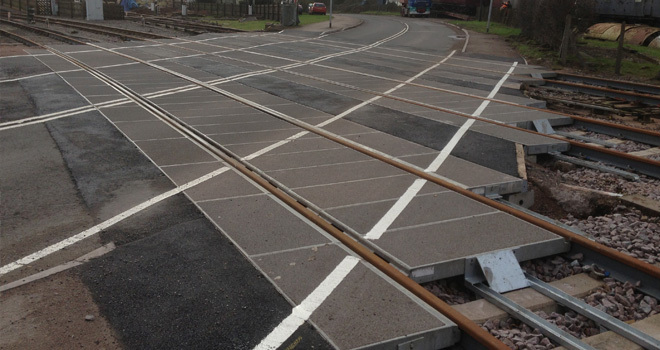 The client required a level crossing deck that could cope with these environmental challenges so a Polysafe Polymer Level Crossing System was installed using Polysafe Ground Beams to suit the curve on the railway. This system uses the latest in polymer concrete technology and eliminates the problems often associated with systems that are supported by sleepers or ballast. The system has the same or higher skid resistance as a regular road surface, even in the wet, helping to avoid accidents and associated delays. The decks are also easy to paint with yellow hatching or white lines to increase safety. Polysafe systems are renowned for their strength and durability and can be expected to last for fifteen years or more. The system features heavy duty end restraints to prevent dangerous gaps appearing even under extreme conditions. The design of the system means that it fits around Pandrol clips and is supported by the strength of the rails so it doesn't need to be full depth. This means that water can drain away underneath rather than sitting around the Pandrol clips and rail and creating rot.